In 1907, Willa Cather moved to Boston on assignment for McClure's Magazine to verify the biographical materials on Mary Baker Eddy, founder of the Christian Science Church, that were the basis for a series of articles to be published in the magazine throughout 1907-08. Cather's most cherished memories of her time in Boston are found in the essay "148 Charles Street" in Not Under Forty, which recounts her initial meeting with Annie Fields, widow of Boston publisher James Fields, and Sarah Orne Jewett. As much as Cather recounts the beginnings of two very important friendships in that piece, however, she also evokes the elegance and grace of the golden age in America's cultural development. Visitors should plan for a leisurely exploration of the charming streets and lanes on Beacon Hill and should absorb the rich history and ambiance of this neighborhood, which Cather called home for a short time. She was transformed by Boston and by the people she met and befriended there, as her account of her visits at the home of Annie Fields attests. It is indeed, the "peace of the past" one seeks in visiting Beacon Hill today. G. Public Garden For Cather devotees, the tour begins at the Parker House [B], Cather's first home in Boston and a key location in the city's literary history. Following steps that Cather might have taken on the day she was taken by Mrs. Brandeis to the Field home, proceed up Beacon Street, past the Boston Athenaeum, the Massachusetts State House, and turn into Walnut Street. 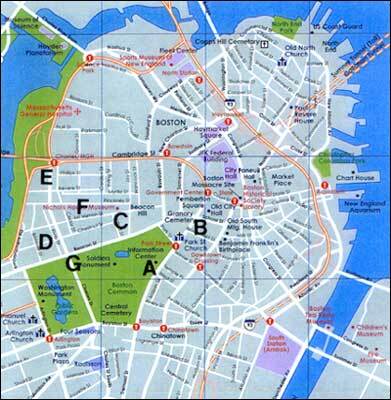 Its first intersection is with Chestnut Street [C], where you can take in the view down toward the Charles River that Professor Lucius Wilson finds so "pleasant" in the opening scene of Alexander's Bridge. As you make your way down Chestnut Street, recall that Cather took an apartment here during her Boston year. Cross Charles Street at the foot of the hill and continue on Chestnut in that part of the neighborhood known as the "flats" of the Hill. Coming to Brimmer Street [D], turn right and the first intersection on the left will lead to Otis Place, where Mrs. Brandeis lived. Return to Brimmer Street and continue to the Church of the Advent, at the corner of Brimmer and Mount Vernon. You are now in Bartley Alexander's neighborhood, although standing on Brimmer, you won't be able to see the river or the "white lights along the Cambridge Embankment" as Alexander could from his library or the study of his townhouse. Returning to Charles Street along Mount Vernon, you will pass No. 102, where Henry James lived after his mother's death. At the corner, note the Charles Street Meeting House, an activist religious and civic center since 1807 and particularly significant to the Abolitionist Movement. William Lloyd Garrison, Harriet Tubman and Frederick Douglas all spoke here. Turning left on Charles, you can make your way to 148 [E], site of the Fields home and now sadly the site of a garage. As Cather explains, "Only in memory exists the long, green-carpeted, softly lighted drawing room and the dining-table where Learning and Talent met, enjoying good food and good wit and rare vintages, looking confidently forward to the growth of their country in the finer amenities of life." In a city so proud of its preservation instincts and in a neighborhood that so clearly captures time past, it is indeed sad that this house has been lost to us. Turn back along Charles Street and explore other aspects of this district. At the very least, turn into Pinckney Street on the hill side and walk up to Louisburg Square [F], which Robert Lowell called "the hub of the hub." Among the famous residents of this lovely square have been William Dean Howells (Nos. 4 and 16) and Louisa May Allcott (No. 10). 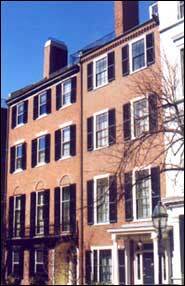 Nearby, at 131 Mount Vernon, is another of location where Henry James lived in Boston with his sister, Alice. The boutiques, antique shops, and restaurants along Charles Street provide another kind of diversion, and a day on the Hill might well conclude with a restful moment in the Boston Common or the Public Garden [G]. You should enjoy a cruise on Boston's famed swan boats, which have sailed in the Garden's lagoon each summer since 1877. The city is full of fine places to eat on every block in both neighborhoods. Fish and seafood, however, are a Boston specialty, so a few recommendations in that category are included. When it comes to accommodations, Boston is a very expensive city. And because late spring is a very busy season for graduations in Boston, hotel reservations are essential. Accommodations in many price ranges are available; check the web to preview the many options.